Lucero's 'Among The Ghosts' Does A Little Musical Demolition Lucero, now 20 years strong, captures some of its raw live energy in a way the band hasn't done since its first handful of albums. Lucero's new album, Among the Ghosts, is out August 3. "If it ain't broke, don't fix it," may work just fine for lazy handymen, but it makes for pretty boring music. 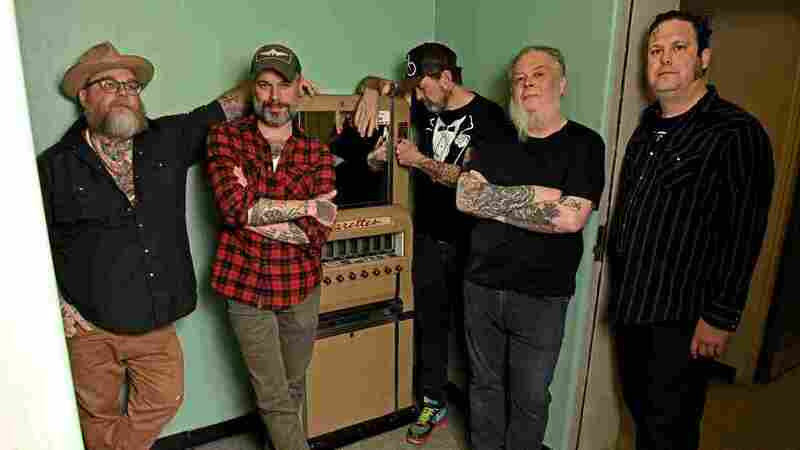 So for Lucero's new album, which coincides with the band's 20th anniversary playing together, everything was in working order, but they decided to do a little musical demolition anyway. Recorded live in one room with producer Matt Ross-Spang at Memphis' legendary Sam Phillips Recording, Among the Ghosts pulls off the difficult feat of capturing some of its raw live energy to tape in a way the band hasn't done since its first handful of albums. Opening the LP is the title track, which begins with an ominous little guitar riff that wouldn't sound out of place on a similarly Southern Gothic endeavor like AMC's show Preacher. Frontman and principal songwriter Ben Nichols' gruff vocals have never sounded sturdier than they do on that track, as he manages to make a rock and roll growl sound tender when singing a narrative loosely inspired by his love for his young daughter. Family is a leitmotif throughout the album, as heard again in standout track "To My Dearest Wife." That song was inspired by actual letters written by Civil War soldiers to their family members, a separation (albeit mostly bloodless) Nichols and his band mates can relate to after spending the better portions of their adult lives on the road. It incorporates a portion of "Battle Hymn of the Republic," which, as Nichols explains, was a conscious decision, not to use a Confederate song despite the band's Southern roots. Elsewhere, the band offers a big-hearted message of hope on closing track "For the Lonely Ones," which was tailor-made for a sweaty night dancing in a tiny club, and, with its Stax-esque horns, also retains a little of the soul and R&B influence of earlier albums. "Back to the Night" veers into Southern grunge territory, and features an eerie spoken word cameo from actor Michael Shannon. While Lucero had nothing to fix, they still managed to build upon what's become one of rock music's strongest foundations. Among the Ghosts is certainly a return to the band's roots, though it's also an album Lucero never could have created without two decades of writing, touring, and companionship under its collective belt. It's the loving, craftsman-like work of the rare kind of band with enough spirit to fill an arena, but with its heart planted firmly in the garage.